↑ Hazrat NasirudDin Mahmud. Entitled Raushan Chiragh-i-Dihli Sufi Saints of Delhi. ↑ Nizamuddin Auliya Ain-i-Akbari, by Abu'l-Fazl ibn Mubarak. English tr. by Heinrich Blochmann and Colonel Henry Sullivan Jarrett, 1873–1907. The Asiatic Society of Bengal, Calcutta, Volume III, Saints of India. (Awliyá-i-Hind), page 365. "many under his direction attained to the heights of sanctity, such as Shaykh Naṣíru'ddín Muḥammad Chirágh i Dihlí, Mír Khusrau, Shaykh Aláu'l Ḥaḳḳ, Shaykh Akhí Siráj, in Bengal, Shaikh Wajíhu'ddín Yúsuf in Chanderi, Shaykh Yạḳúb and Shaykh Kamál in Malwah, Mauláná Ghiyáṣ, in Dhár, Mauláná Mughíṣ, in Ujjain, Shaykh Ḥusain, in Gujarat, Shaykh Burhánu'ddín Gharíb, Shaykh Muntakhab, Khwájah Ḥasan, in the Dekhan." ↑ Khalifa List of Successors of Nizamuddin Auliya, "Moinuddin Chishti " official website. ↑ Chisti Saints Archived 2009-06-01 at the वेबैक मशीन. ↑ अ आ Chirag Dilli Tomb Mosques & Shrines in Delhi. ↑ अ आ Life History Moinuddin Chishti Official website. ↑ अ आ इ ई In The Name Of Faith Times of India, April 19, 2007. ↑ अ आ Ayodhya's Forgotten Muslim Past "Counter Currents", 23 October 2003. ↑ The Tradition of Arabic Devotional Poetry in India… Hind Islami Tahjeeb Ke Rang : Aqeedat Ke Rang, "Indira Gandhi National Centre for the Arts" (IGNCA). ↑ Jihad in the East: A Crescent Over Delhi The Shade of Swords: Jihad and the Conflict Between Islam and Christianity, by M. J. Akbar. Routledge, 2002. ISBN 0-415-28470-8. Page 111. ↑ Urs-e-Sharief of Khwaja Bande Nawaz in Gulbarga from tomorrow "The Hindu", November 27, 2007. ↑ Delhi's Valley of Kings The Tribune, March 1, 2004. 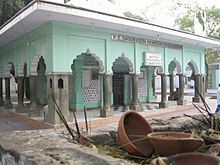 ↑ Dargah of Chirag-e-Delhi locationWikimapia. ↑ Major P.W. Powlett (1878). Gazetteer of Ulwur. पपृ॰ 40–41. ↑ "Shaikh Muhammad Makhdum, Arzang-i Tijarah(Urdu)( Agra: Agra Akhbar 1290H)"
Hazrat NasirudDin Mahmud, 'Raushan Chiragh-i-Dihli', Biography and Dargah details.